Whistler used tonal contrasts to evoke mood and feeling, rather like pieces of music. This masterful technique is evident in his paintings of the Thames, where heavy fogs smudge the outlines of boats and bridges, creating worlds both beautiful and sinister. About the artist: James Whistler (1834 – 1903) was an American artist who worked during the American Gilded Age. He influenced the art world and the broader culture of his time with his art theories and his friendships with leading artists and writers. Whistler’s mother sent him to Christ Church Hall School in the hope he would become a minister. But Whistler spent most of his time drawing and was popular with his classmates for his charismatic portraits. He worked several jobs before delving into the art world, all of which he found dull. He was transferred to the etching division of the U.S. Coast Survey after it was discovered that he was drawing sea serpents, mermaids and whales on the margins of the maps. It was only after moving to Paris in 1855 that Whistler began to paint professionally. His famous signature for his paintings was a stylised butterfly possessing a long stinger for a tail. The symbol was a metaphor for both aspects of his personality: the subtle frailty of his art combined with his combative public persona. He found a parallel between painting and music and referred to many of his paintings ‘arrangements’, ‘harmonies’ and ‘nocturnes’. 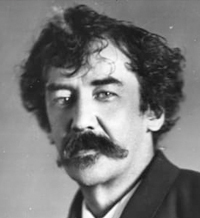 Whistler was known for his obnoxious personality and short temper. On one occasion, when he accidentally shot his host’s dog, he said, ‘It was a dog without artistic habits and had placed itself badly in relation to the landscape’. His most famous painting, Arrangement in Grey and Black No. 1, also known as The Artist’s Mother, was completed in 1871. Whistler died in 1903 after dabbling in some minimalist watercolour seascapes and a final self-portrait in oil.